The biggest challenge for any website is to fight against the situations of downtime issues. One possible reason for downtime could be denial of website access. Generally, DDos or Distributed Denial of Services are targeted to disable the resources that keep the websites up and running. When a website is under DDos attack, it stops responding to the user activity either due to crash of network functionality or insufficient resources like bandwidth or disk space. The attack could be intentional by malicious attackers or hackers to bring the website down or it could be simply due to heavy influx in traffic during peak hours. How Websites Get Affected When There is Peak Volume of Traffic? Generally websites experience higher traffic influx when websites go viral or when there is higher demand for website offerings during peak season. In such cases, due to unavailability of enough resources, websites fail to serve the legitimate requests of the users. Sometimes, it is also possible that site may encounter a real malicious attack, which may slow down its performance or make it completely inaccessible for the users. It could be either a volumetric attack affecting the servers with significantly large capacity of requests than it can handle or an application layer attack disabling specific function or feature of the website. Whatever the reason might be, when such instances happen there will be interruption to the website service and online businesses get direct and indirect losses in revenues based on complexity of the issue. What Will be The Impact on Online Revenues? The impact of DDos attack depends on the downtime duration and complexity of the issue. Unfortunately, some websites experience downtime for prolonged period of time ranging from days to even months. In some cases, it becomes difficult to quantify the losses because it can be cumulative loss in terms of both revenues and reputation damage. If customers are dissatisfied with website performance, they give up these websites and move on to other competitors site with better performance. In addition to that, businesses may have to spend substantial amount to get their websites back to normal and execute preventive measures to protect their sites from such occurrences. It is always better to have some preventive measures to protect the websites from such attacks rather than identify and resolve the problems when issues happen. To deal with such downtime issues, many site owners have scaled up hosting services with a flexibility to accommodate high traffic for their websites. Or sometimes, site owners opt for third party tools that run the custom scripts to check website’s endurance for heavy traffic loads. These methods provide only temporary solution but cannot continuously watch websites for downtime instances. 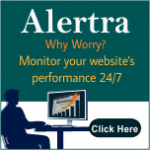 The best effective approach is to use a comprehensive website monitoring service that keeps a check on server activities and track the site traffic for any changes. The site monitoring service detects the instances of such possible issues and alerts site owners immediately, so that they can have a plan in place to quickly respond and resolve the issue.